Take a look around … if they were fattening us up for harvest, the feast could have started years ago. 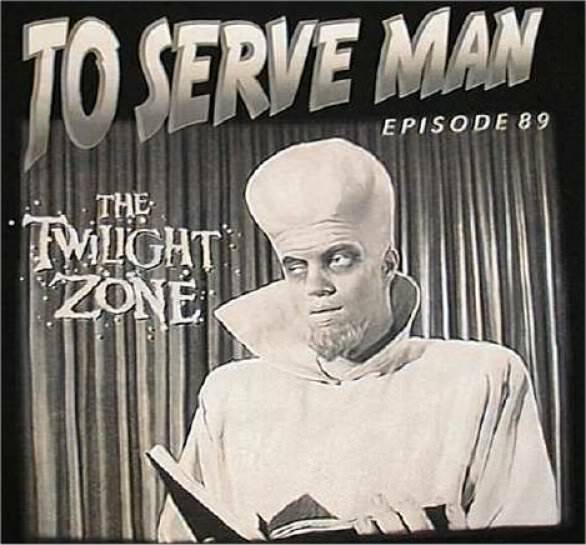 As much as I love and respect The Twilight Zone, “To Serve Man” was fiction. Again, we have Hollywood to thank for this misconception. It makes for great entertainment on the big screen, but the aliens have evolved beyond the need for wars and weapons. They do have defensive measures they can and will use if they are threatened, but they don’t fly fighter ships dodging and shooting lasers. They have already proven their ability to disarm our nuclear weapons. Who says that aliens must look like us? It seems to me that, given the exquisite variety of intelligent life right here on Earth, how much more vast and unique would lifeforms be in the rest of the universe? I have seen aliens who do appear as the classic “Grey” alien, small and fragile with green-grey skin and huge almond-shaped glossy black eyes in a short humanoid body. But I’ve also seen tiny aliens with iridescent wings who look like fairies or dragonflies; beings who have multiple legs and skitter sideways like a crab; fuzzy brown critters who move so fast they can only be seen by a human out of the corner of the eye. There is no end to variety in the Universe. Aliens do not comprehend human emotions. Because they are, you know, alien. This does not mean they don’t have emotions of their own. Perhaps it is we who do not understand their emotions? Once you get past the primal fear of interacting with an alien species, you can begin real communication and discover they are actually quite witty and humorous. When we finally reached a mutual understanding that I did not appreciating them coming into my warm safe bedroom and interrupting my slumber by hovering within an inch of my face, they tried contacting me in other ways. One night I was awakened to a sing-song voice calling my name in a tone that sounded vaguely like my own mother’s, “Oh Donna, oh Dooooonnnna.” It wasn’t until the next day I realized they were trying to imitate the Richie Valens song. On another occasion I was startled awake and feeling disoriented, as is the norm when interacting with them. I felt the urge to look at my bedroom closet and there were 3 Grey beings peeking out from around the corner of the closet door, one above the other. Earlier that evening I had watched a movie with a similar scene. That night was a breakthrough and the very first time I willingly went with them. I could sense their excitement as much as my own. Many readers will disagree with me, and they are welcome to; I can write only of my own experiences. I have been shown that they simply do not care enough to become involved with our petty differences and selfish squabbles. Do you concern yourself with the pecking order of a brood of hens? Unless you are a beekeeper do you wonder what the queen bee is doing? Aliens see the BIG picture; they are concerned with the overall health of planet Earth. Unless we are about to unleash a nuclear weapon or other device with devastating consequences to the planet they watch from a distance, allowing humans to have Free Will. The Free Will of humanity has a boundary in which we are not allowed to destroy the Earth to an irreparable state. Some of us have difficulty accepting that people can be incredibly evil, hurtful, and cruel to one another and to other living beings and the world as a whole, so they ascribe these characteristics to evil aliens. Unfortunately the truth is that some humans are just that bad, but somehow it’s easier to accept or even justify if one believes those people are under evil alien control. This is one in which they find great humor. Aliens are superior at reading people and their intentions, and for that very reason they do not approach many politicians. They much prefer individual interaction and at present are in contact with many thousands of people around the globe. They also found it humorous when the United Nations appointed an official Ambassador to interact with extraterrestrials, should they make themselves known. Humans are so egocentric as to believe it would be up to them to decide. 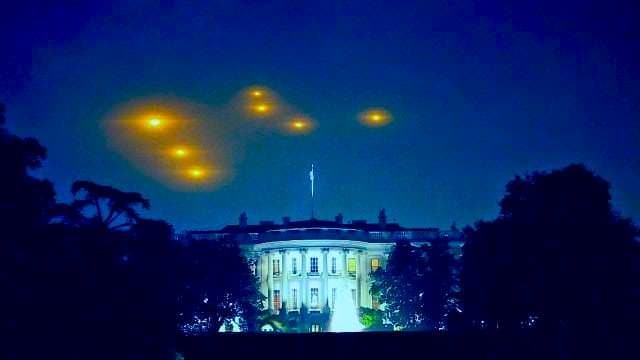 The aliens have already chosen their ambassadors; some who are aware and others who have not yet come to terms with it, but it ultimately will not be the decision of any government affiliates. Overall the aliens avoid politicians and any humans who are self-serving rather than seeking the best interests of others – ALL others, not just human – and the Earth. We call aliens “extraterrestrials” with the assumption they are from a place other than Earth. This could be true. But in reality no one knows who they are, where they come from, why they’re here, or when they come from. I’ve been given visions of alien places that I believe are other planets, but it’s possible that they are right here, right now. We perceive our known reality through our five senses. Sight, for example, is known to be limited to us. Our eyes and brains perceive only a small percentage of the available light spectrum. We can’t see UV (ultraviolet) rays. We can’t see x-rays. Many species have the ability to “see” that which we cannot. The lowly mosquito uses thermal sensory information to find a warm body to feed on. Hawks and eagles have eyes with different structure than ours, allowing them to see much farther, more colors, and a 340-degree visual field. Cats and owls can see in the dark. Sound is another sense with which we help to define our reality, so does that mean bats, dolphins, and other sonar-based species live in a different reality than we do? What about dogs, who can hear and smell things far beyond our abilities? There’s a reason dogs are used in search and rescue; they sense the world in a way in which we are incapable. The larger reality encompasses so much more than the limited reality our senses relay to our brains. It’s entirely possible that a being who has a brain which interprets reality with their own senses – senses completely different than ours – exist in the same space and same time and we are entirely unaware of each other. It’s not a far step from that to wonder if that other species is aware of us, but we are not aware of them. They do not involve themselves with us unless we start destroying that which affects their reality, their way of being, like nuclear testing or particle accelerators. Sounds, sights, smells are all frequencies. Aliens may simply live on a different frequency than we do. It’s like the old TVs where we live on channel 3 Earth and they live on the UHF channels. Sometimes, when the rabbit ears or the outside antenna need adjusting, the channels bleed together a bit and one channel overlaps another. This could be what happens when we glimpse a ship in the sky that suddenly disappears, or an alien in the corner of your eye that slips out of sight when you turn to look. The ships I’ve been on are full of life, more comparable to a bustling garden with large windows than the cold metal ships presented by Hollywood. Plant life is abundant and used for food, breathable environment and proper humidity. Some of the plant life is fully conscious, aware, and capable of mobility and communication. Waterfalls are in abundance both in their habitations and their ships; I believe they use waterfalls as a source of energy for personal invigoration. The vast array of species is inconceivable to an overwhelmed mere human brain on observing this environment. In the beginning, when I was filled with fear, I was taken to sparse white rooms with only a silver table in the center; and instruments which emerged and then retracted into the walls as required. Now that I have gotten beyond the terror and interact with these beings as my friends, they feel safe in sharing the rest of the ship with me. They are not so different from us after all; they are proud of their homes, their relationships and their work, and are pleased to share them with us if only we would stop being afraid. About the author: From the time she was a small child, Donna Lynn experienced night terrors that were so disturbing they affected her waking life and relationships. Empowered at last, she consciously chose to venture into that territory of the unknown to do battle with otherworldly beings who had haunted her dreams since childhood – only to find out they are not here to do battle at all. They come with powerful messages of love and healing on personal and planetary levels.